Garmin has unveiled the Vivosmart HR, a new version of its top-end fitness tracker with added heart rate tech, as well its first set of smart scales. Starting with the Vivosmart HR, the activity band has been totally redesigned to add an optical heart rate monitor. It's the first Garmin band to sport HR smarts, which has become a new battleground for fitness trackers. The Fitbit Charge HR, Jawbone UP3 and the new Polar A360 all feature heart rate sensors. The Vivosmart HR comes hot on the heels of the Garmin Forerunner 235 running watch released last week, and uses the company's proprietary Elevate technology. The Vivosmart HR features a 160 x 68 touchscreen, which will display notifications from a paired smartwatch, as well as showing tracked steps, calories, heart rate and workout data. However, there's no GPS onboard for accurate run tracking. The big differentiator for heart rate monitoring wearables is whether bpm readings are taken 24/7, which is a good barometer of improving fitness, or just during workout sessions. While the Polar A360's HR tracking is limited to specific activities, Garmin has confirmed that the Vivosmart HR will track your vitals all day. The Garmin Index Smart Scale is the first product of its kind by the company, and fits neatly into its health and fitness line-up. Garmin Connect already tracks weight, so it makes sense to offer a set of scales to do it properly. The Index Smart Scales will measure body mass index, body fat percentage, water percentage, muscle mass and bone mass. Like the Withings Smart Body Analyzer, you can also set up multiple profiles for different members of your family. It will automatically recognise the user when they step on the scales, and will record their information in Garmin Connect as well as syncing with MyFitnesssPal. The Index Smart Scale is an exciting addition to the Garmin lineup," said Dan Bartel, Garmin vice president of worldwide sales. "We designed this smart scale to be both beautiful and functional, and with it we're able to complete the wellness circle of weight management. We're excited to offer this as an option to our millions of running, cycling and multisport athletes who are looking to track body composition data along with the rest of their data in Garmin Connect." 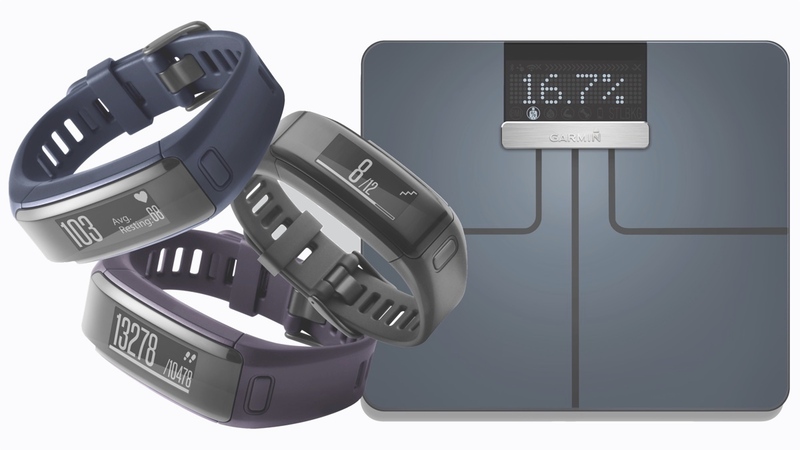 The Garmin Vivosmart HR and the Garmin Index Body Scale are both on sale in November, and both retail for $149.99.